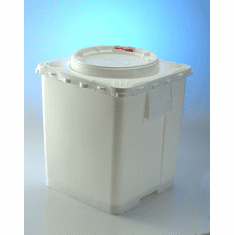 This 12 Pack Case of 0.6 Gallon Life-Latch Buckets comes with Screw Top Style Lids that feature outside threaded buckets with a air tight screw top lid that has the innovative locking trigger mechanism to automatically secure the cover that is tamper-evident, senior friendly and child resistant, yet easy to open and reseal. 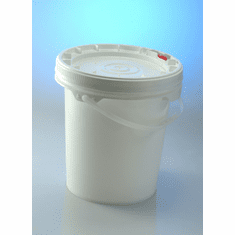 Re-Usable plastic pail with Added-on plastic handle, and re-usable plastic cover. UN-Rated & Children-resistant and friendly for seniors. 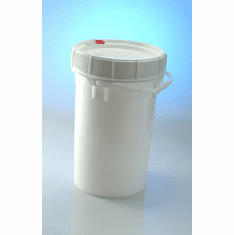 approved to UN and DOT-35 Plastic Screw-Top Pails. 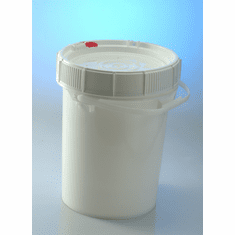 Plastic Screw-Top Pails/Buckets are white and Lids are usually available in White, Red, and Blue. 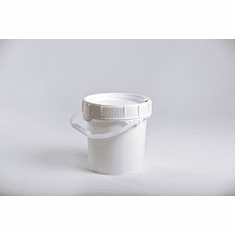 The lid features a vacuum-tight, moisture-resistant seal. Along with this great new feature, you and your customers will find this pail offers great stackability and pours liquid without dripping. This Plastic Lid has a unique trigger mechanism that automatically locks the lid when closing, and has a simple finger-activated release to allow the lid to be opened.